Ask anyone famous -- it's hard being popular. Everyone wants a piece of your attention, while only a select few are actually worthy of it. If 9mm ammo could talk, it'd agree. Being the most popular handgun ammo in the world is hard. 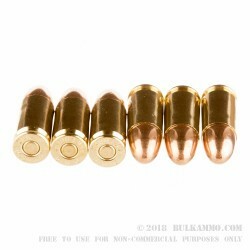 And, if asked, it would also tell you that PMC's Bronze 9mm FMJ cartridge is one of the few worthy of your time. Low cost and high quality make it ideal for frequent trips to the range, an act required by those looking to hone their shooting skills. PMC's Bronze 124 grain FMJ bullet travels 1,150 feet per second out of the barrel and produces 338 foot pounds of muzzle energy. The boxer-primed brass is safe to reload. 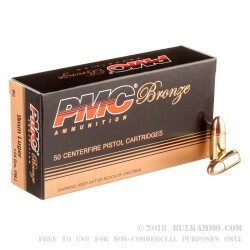 The ammo itself comes packaged in plastic 50 cartridge trays wrapped in a PMC Bronze branded cardstock box. 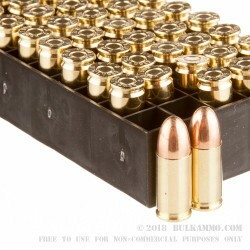 The case contains 20 trays of ammo. Cheap, soft kick, dependable and a little dirty. Bought from yall before, always satisfied with products and service. Bought a 1000 rounds, but only shot fifty rounds, so far so good. Great target ammo at a great price.